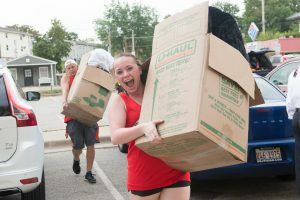 Around 6,100 students will travel to Illinois State University August 13-19 for the fall 2018 move-in. Students will have assigned move-in dates and times depending on their housing assignment. Move-in for Fell Avenue and School Street apartments starts Friday, August 3. Returning ISU students who will be living in Hewett and Manchester or Cardinal Court may move in Monday and Tuesday, August 13-14, or after Friday, August 17. Approximately 60 percent of residence hall residents—students in Hewett, Manchester, Watterson, Wright, Wilkins and Haynie—will move in Wednesday and Thursday, August 15-16. Students brand new to Illinois State and living in Cardinal Court will also move in Wednesday and Thursday, August 15-16. The remainder of returning students will schedule move-in appointments between Friday and Sunday, August 17-19. University Housing has a 2018 Move-In Guide on the Illinois State App that provides information on getting to campus and what to expect after a student moves in to University housing. Members of the community can also download the app to keep up-to-date with information regarding move-in, such as road closures. Temporary traffic patterns and some street closures will be in effect August 13-17. North Street will be one-way east from School Street to Fell Avenue; Fell Avenue will be one-way south from Mulberry Street to College Avenue and North Street to Beaufort Street (only move-in traffic allowed); Fell Avenue will be closed between College Avenue and North Street; Fell Avenue will be closed for all northbound traffic. As always, additional and abnormal traffic is expected August 15-16. More than 300 students and staff will serve as move-in volunteers. The volunteer ranks will include Association of Residence Halls members, student athletes, and athletic staff. For more information or details about temporary traffic patterns or move-in week, visit the University Housing website, Housing.IllinoisState.edu or download the Illinois State University app and search for the 2018 Move-In Guide.